After more than 14 hours of swimming through strong winds, currents and heavy seas of the English Channel, Jimmy Loreto ’95 swam ashore to the beaches of France as the sun set on the evening of 22 July 2018. Greeted by friends and family, his English Channel crossing accomplishment was the final leg in the endurance goal that he set many years ago. The celebration of the successful English Channel swim also included the added bonus of Loreto becoming the 188th person to achieve the “Triple Crown” of open water swimming. The training regimen for marathon swimming is grueling. In the last three years, Loreto adopted a routine of swimming at least 100,000 yards per month on a year-round basis, both in the pool and in open water. With the English Channel water temperatures typically ranging between 60 to 62 degrees in the week of Loreto’s planned swim, he turned his attention to both mental and physical preparation and cold-water acclimation. In talking with his classmates and the board of Run to Honor, Loreto knew his mental preparation involved drawing inspiration from his fallen classmates in Memorial Hall. To support his swim, Run to Honor produced a custom-made “Swim to Honor” cap for him to use. Loreto swam the Channel with the last names of classmates Major Doug Zembiec ’95, USMC, and Lieutenant Commander Erik Kristensen ’95, USN, on the side of his cap that also included a gold N-star in honor of all Naval Academy Gold Star families. “They were my inspiration to keep going no matter what occurred during my final phase of training in the Irish Sea and on the day of the swim attempt,” said Loreto. In the end, this is also a story of an Academy friendship and teamwork. Loreto’s classmate, Captain John “Doc” Dougherty ’95, USN, played a key role in the “Triple Crown” effort. 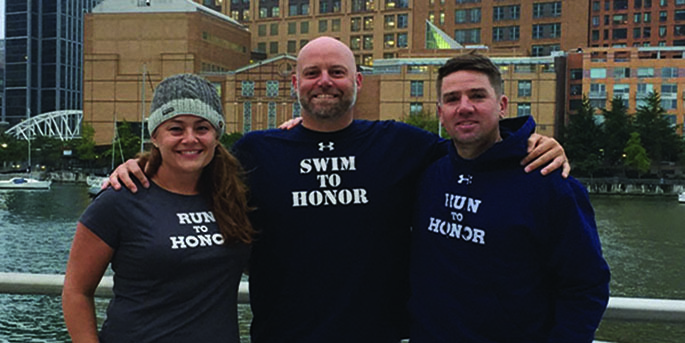 The authors are the co-founders of Run To Honor, a Shared Interest Group (SIG) with the Naval Academy Alumni Association. For more information on Run To Honor and their activities to honor the fallen, visit www.runtohonor.com and www.usnamemorialhall.org, or contact Dave Richardson '95 at president@ runtohonor.com. On the morning of 22 July, we met at 4 a.m. to load the boat with supplies and meet with the boat pilot and certifying official. I had six members of my support crew that were responsible for feeds, general safety and passing information to me. Doc, my crew captain for all three Triple Crown swims, handled all communications, organized the feeds and coordinated everyone’s responsibilities. The swim was cold in the beginning but felt good. After about six hours when your body starts burning fat, you feel terrible, but I knew that was coming. I only asked for three info points—leaving English waters, the separation zone and then leaving the French shipping lane. After about six or seven hours, the weather and wind picked up. It wasn’t expected, and for the next eight hours we had 15 to 22 knots of winds and swells up to six feet. I quickly knew it was going to be a longer swim, and it was tough. I also was having trouble with the feeds hurting my stomach. I added warm soup and bananas to hold off cramps and just switch things up. After about 12 hours, I just wanted to know how much longer and if I needed to push harder to break through the current. I just had to live “feed to feed” (every 30 minutes), and that became my goal. I never felt terrible with the cold but was thankful it wasn’t too cold and that I had trained for it. In the end, I got the call from Doc that this was the final feed and that they would give a call soon to swim to the beach. I had no idea we were that close. The boat was blocking my view, as the beach was to my left. Once I saw it, I felt a sense of relief that we were close. Doc yelled to swim to the beach. I cut across the boat and swam ashore. Seeing the sand for the first time in 14.5 hours was surreal, and I walked the final steps and collapsed on the beach in joy and exhaustion. I was lucky to have my wife, two of my three kids, my mother, Doc’s son and my cousin’s girlfriend there to greet me. It was surreal. After five to 10 minutes we swam back to the boat and it was freezing … all the adrenaline was gone. I got on the boat and had a 2.5-hour ride home that consisted of me throwing up the whole time. All the salt water I swallowed from the bad weather and the feeds got to me.